Goa is the western coastal state of Indian located in the coastal region of Arabic Sea. Panjim is the capital of Goa. According to the limitation of the area, Goa has sufficient numbers of engineering colleges across the state offering various disciplines in the field of engineering and technology. The average literacy rate of Goa is 88.70%. Goa was the territory of Portuguese till 1961. 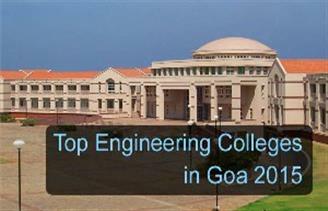 We at sarvgyan.com have listed the 9 top engineering colleges in Goa 2015 academic session on the basis of various factors that are valuable for academia. We have included the IIT, NIT, BITS Goa, and Padre Conceicao College of Engineering, Don Bosco College of Engineering and Goa University.